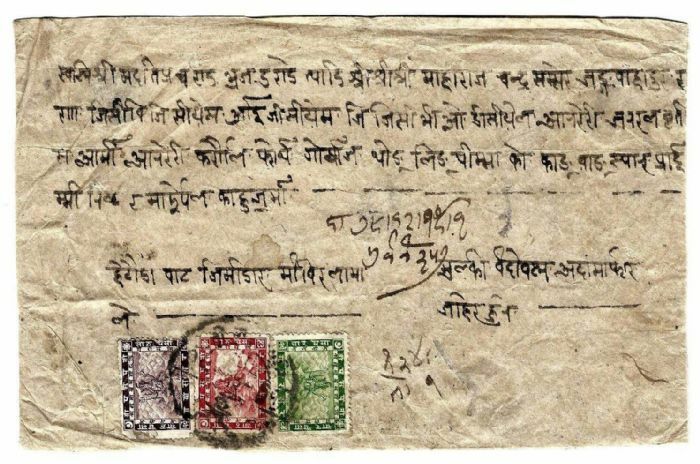 Although my collectors interest is primarely focused on the Postal History of Nepal, nonetheless I was intrigued by this letter in order the unusual aspect of 8 Paisa stamp. Until this moment I was not particularly attracted by printing variations of stamps and so I had first of all to familiarizing with the theme - but I fear without a mentionable success. The peculiarity for that I can not give me a tangible explanation is the sharp and well-defined shape of the colorless area: Only the mountains are unprinted whereas the edge of the sky and also Pashupati's arm are correctly reported. I would have expected as a matter of fact that an insufficient inking of a monocolored cliche should have produced a random white field on the stamp with soft borders that would have invaded as well the sky and the image of the Pashupati divinity. 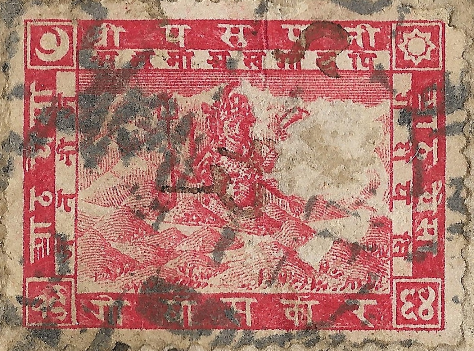 I would be very grateful to receive the opinions and suggestions of collectors who have more knowledge than me about the printing peculiarities of the Pashupati stamp issues. 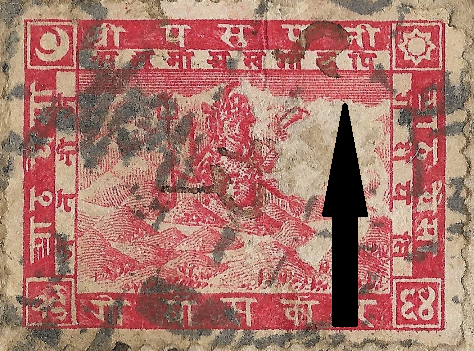 Herbert - Although I have seen similar "void area" printing flaws in the Nepal Printed Pashupati issues, it is less likely to be a printing flaw on the 1907 issue because of better quality control employed by Perkins Bacon. In general flaws like that can be the result of a paper overlay during printing or a "dry print" where the plate was either not inked correctly, or over-wiped before printing. Having said that, I think what we are looking with your stamp is a post-printing fault. Maybe another gummed stamp pulled away some of the surface or maybe the stamp received some other form of surface rubbing. Thanks for your tips. I also had thought about these hypotheses, however those have not led me to explain the unspoiled skyline. A "dry printing of a monoplate" or "post-printing fault" would probably have produced a void area with random borders which likely would not follow exact the skyline. I am still astonished by the strange intactness of the Skyline and I am grateful for any further opinion or information. Over-wiping of the plate would leave ink only in the deepest grooves. Also partial dry print caused by under-inking. In either case, the result would be the same; the mountains which are deeper cut would show and the more shallow lines would not. In short, without finding multiple copies of the same variety, you have to assume the most plausible cause - a non constant printing variety. I just uploaded a scan of an 8p proof sheet dated in margin 13 Sep 1913. I see no plate flaws. Nice sheet. Does it have an inscription "8 pice lake?" The bottom margin at extreme lower left has "8 LAKE"
In the right margin, somebody has also added, at a later date, "wmk" in pencil with an arrow pointing to position 70 impression which shows a portion of the watermark. I am wondering if this sheet is from Dr. Armand Singer's collection. He pictures a similar sheet in his book which is unfortunately clipped off at the edges of the picture so that the sheet margins cannot be seen. However, he notes the 8 lake inscription and the date in the text. If you are unfamiliar with his book, it is very interesting but the quality of the images is terrible because it was printed using an old xerox machine.